Thank you so much for everyone who has been following my blog, I've reached 50 and I think I should celebrate it with a giveaway! This giveaway is open for indonesians only (I'm really sorry for international readers). So, I'm giving away 5 Hello Kitty glasses in different colors for 5 of my beloved readers, so each person will get one pair of glasses, so there will be bigger chances for you readers! Besides that these Hello Kitty Glasses are really trending and happening right now I also think Hello Kitty is really cute, isn't it? This glasses will add extra cuteness to your outfit. Bubzbeauty the famous make up guru is also wearing it! :) Cute huh? 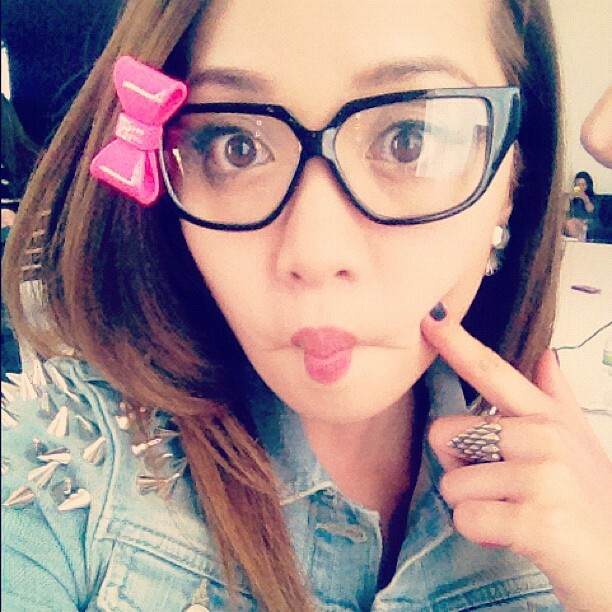 Alright, the ones that Michelle Phan have are not Hello Kitty glasses, but similar because of the big ribbon. So what are you waiting for? Let's join Beauty Appetite first giveaway! So, HOW TO WIN THESE GLASSES? You don't have to do all of them, just leaving comment will do, but If you do all of the them, you'll have 10 entries. More entries you have, more chance to win! This giveaway starts from Sunday 22th July 2012 and ends on Saturday 11th August 2012. I'm going to post the 5 winners the day after. enter me :) thank you..
good luck for your everyone and you! for, everyone else, don't forget to join to win this cutest belt ever! EASY & NEAT STRIPED NAILS!